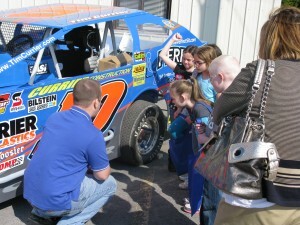 Currier Plastics made a small effort to curb the “brain drain” April 19 by showing about 60 Weedsport second-graders that its factory can offer them rewarding work in their hometown. The Weedsport Elementary School students took a tour of the Currier plant on Columbus Street in Auburn and learned about how it operates, from the design page to the plastic product. Roberts said the Weedsport students toured the factory and got to see how raw resin is fed into a machine and pressed into molds to form shapes. Students also saw the facility’s design lab and learned about software used to craft the shapes that the plastic will take. Currier tour guides also spoke to the students about how math and science are critical fields to master if they want to work at a place like Currier. Roberts said the purpose of the tour is to educate students on how what they do in school is relevant to getting a job later, and also to show them they don’t have to leave Cayuga County to have a good life. Second-grade teacher Anne Kott accompanied the students to Currier. Kott said students learned about many aspects of the plastics business, including the importance of recycling unused resin pellets, how a conveyor belt works, how ovens are used to mold plastic into shapes, what a loading dock looks like and more. Students received tote bags and collected several souvenirs, Kott said. The tour was also very child-safe and tactile. “They could touch everything,” Kott said. Kott said the Currier tour was one of the best she’s experienced in more than 30 years of teaching, and said her students were excitedly talking about going to college for engineering and wondering what it would be like to work for Currier. “It really taught them so many more things than I thought,” she said. Roberts said she knows students are inspired by the Currier tours when they write thank-you notes to the company.